On the occasion of the 25th birthday of the VIS conference and its unprecedented location in France, Charles Perin, Pierre Dragicevic, and Jean-Daniel Fekete organized an exhibit on Jacques Bertin. The exhibit focused on Jacques Bertin’s work that is less known by the community, including his reorderable physical matrices. In addition to exhibiting some of the original material, I fabricated a large-scale wooden replicate for attendees to try themselves. This work was also published in the CHI'15 workshop "Investigating the Challenges of Making Data Physical". Each row or column is mobile and can slide on the steel rods. The wooden matrix was built by first loading the data into the Bertifier software and exporting a 2D matrix visualization in SVG. The SVG file was turned into a digital fabrication design file. Sheets of plywood were laser-cut, laser-engraved and manually assembled. Steel rods were bought in a DYI store and cut. The resulting matrix is a simplified version of the original, but also features a few innovations, such as the use of a magnet mechanism to switch encodings. 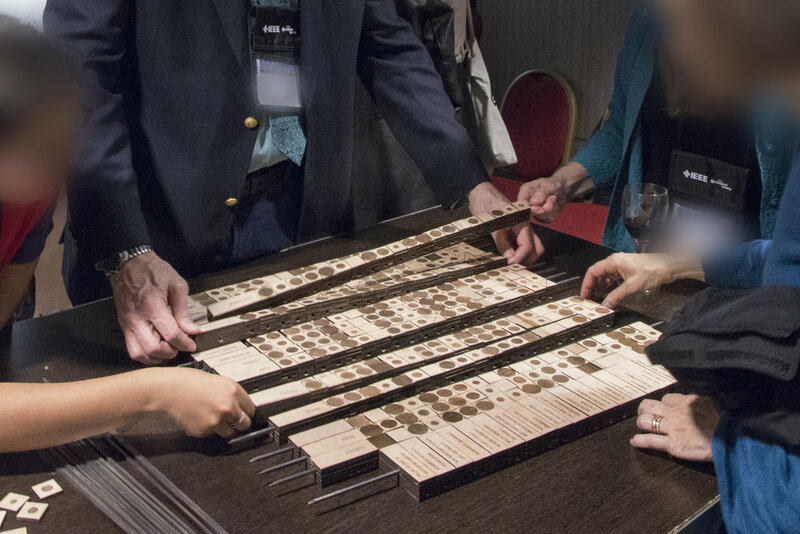 Each domino is made out of plywood and laser engraved for clear and crisp inscriptions. Each domino is constituted of eleven parts assembled together without glue. Encoding caps can be changed thanks to magnets. This matrix was exposed for the Bertin exhibit during the IEEE VIS 2014 conference in Paris.